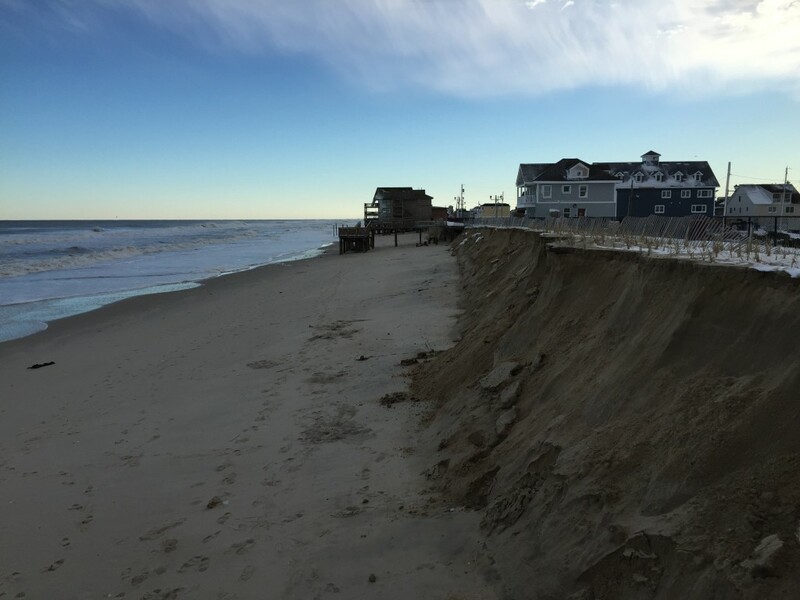 A contingent of state and local officials toured the Ortley Beach oceanfront Monday, following a weekend of rough surf stirred by a nor’easter that threatened to breach the fragile makeshift dune that has been in place since Superstorm Sandy targeted the community in 2012. Lt. Gov. 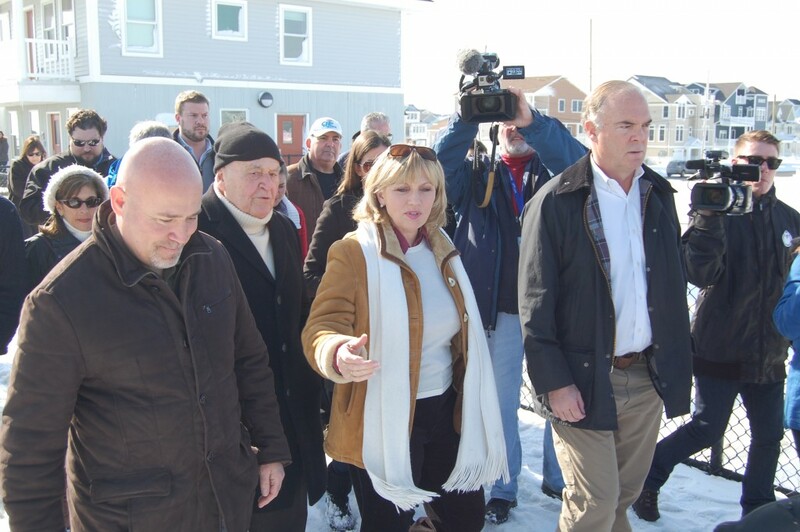 Kim Guadagno led others, including state Department of Environmental Protection Commissioner Bob Martin and U.S. Rep. Tom MacArthur (R-3) along the battered boardwalk area. Beach access ramps were largely inaccessible, having been mangled by the powerful waves which ripped stairways to pieces. Toms River officials have been pleading with state and federal authorities to begin work on a promised dune-building and beach replenishment project that would act as a permanent protective measure. The process has been held up by property owners, primarily in Bay Head and Point Pleasant Beach, who have refused to sign easements to allow the work to go forward. Martin said in recent weeks, he has been able to convince his counterparts at the U.S. Army Corps of Engineers – the agency in charge of the replenishment effort – to start work in Ocean County in areas where large numbers of properties have signed the easements, even if all of the easements island-wide have not been signed or obtain through the ongoing eminent domain process. In the next few weeks, state and Army Corps officials will sit down with maps to plot the start of the project, Martin said. In the mean time, DEP officials on hand Monday said the state would continue to assist Toms River to maintain its temporary berm and deliver sand to stave off a breach in future storms. 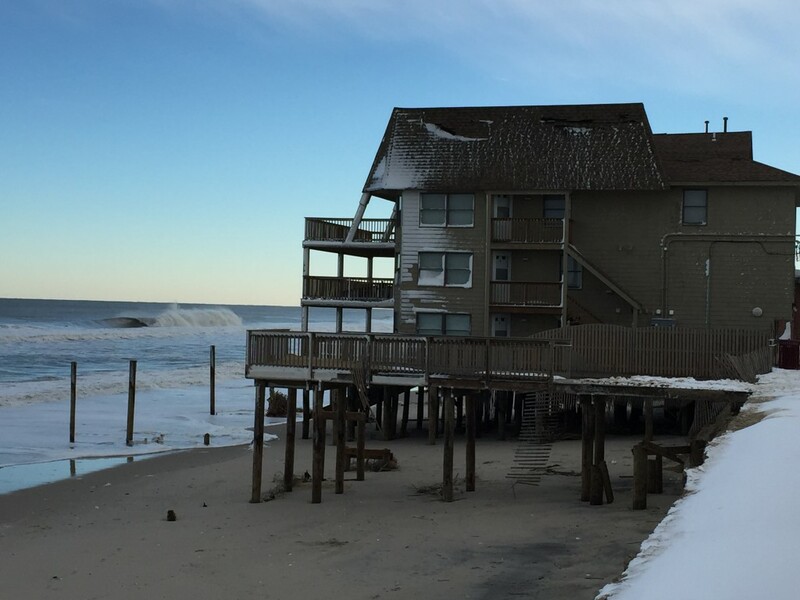 Both DEP and Army Corps personnel were touring the entire length of the state’s coastline Monday in an attempt to assess damage caused by the storm. Toms River officials expect work to begin on a new berm by Wednesday. Its contractor, Earle Asphalt, is on standby. State officials maintain the only permanent solution to Ortley’s dune issues is the federal project. “We’ve got to get the Army Corps to start the project – not when every least easement is in – but there’s an interim start I’m sure they can do,” said MacArthur. Guadagno, serving as acting governor while Gov. Chris Christie is campaigning for the Republican presidential nomination in New Hampshire, said she was planning to meet with South Jersey leaders later in the day Monday to discuss whether the state should apply for federal disaster relief funding. The state would need to have sustained about $12 million in infrastructure damage and snow and debris removal costs to qualify, she said.